This review outlines the progress and current knowledge of stem cell-based treatments for the retina. Basic research, which began as a study of neural stem cells in the 1980s, is now being applied for the clinical use of embryonic stem (ES) cells and induced pluripotent stem cells (iPSCs). The author’s group had transplanted iPS cell-derived retinal pigment epithelial (RPE) cell sheets to the eye of a patient with exudative age-related macular degeneration (AMD) in 2014 as a clinical research. 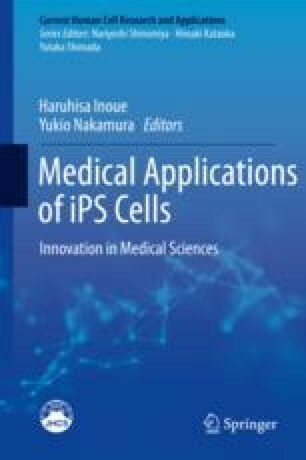 Since it was the first clinical study using iPS cell-derived cells, the safety and tumorigenicity of iPSCs products were especially a great concern. At 1 year after surgery, the transplanted sheet remained intact, and no serious adverse event including tumor formation had been observed. Autologous iPSC, which have lower chance for tissue rejection, is an ideal cell source for a transplant therapy; however, production of autologous iPSC lines is too costly. To address this issue, we are currently exploring the use of allogenic RPE cells from iPSCs of HLA homozygote donors with the Center for iPSC Research and Application (CiRA) of Kyoto University. Regarding photoreceptor implantation, we recently demonstrated a direct contact between the host bipolar cell-end and the presynaptic terminal of the graft photoreceptor by directly implanting retinal tissues derived from murine iPSC into a mouse model of end-stage retinal degeneration. We believe that our findings established a new proof of concept for transplanting ESC/iPSC retinas to restore vision in patients with end-stage retinal degeneration.